As I was boarding my first flight en route to Punta Arenas, Chile I did a quick calculation then texted my wife Maria, 'this will be my sixth trip to Antarctica'. 'It feels like more than six,' she replied dryly. Still, I think there is an opportunity for my kids to at least the places in which I travel and maybe even the passion that motivates me. And it's definitely not a hard sell. Rather, it's more based on fun, being creative and playing. 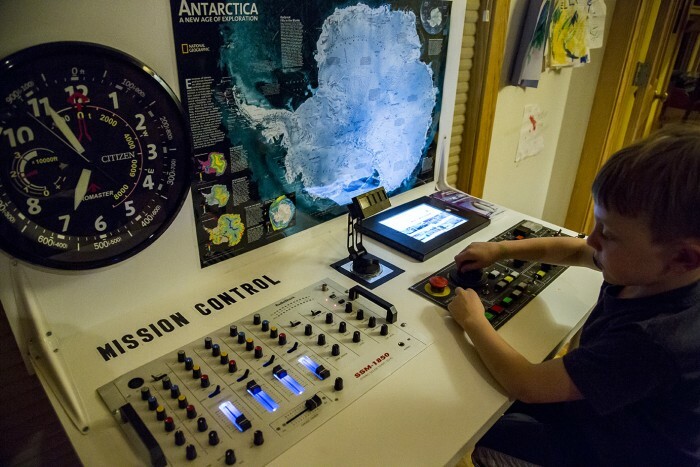 To that end, I built a Mission Control station for my two kids to follow along on my Last South expedition. I bought an old CNC control panel and mixing board of off ebay. Citizen sent me a wall clock that is the exact same face as their Promaster Altichron that I will be wearing in Anarctica. That way, when they look at the clock face, they can know that we are looking at the exact same time. I inlayed an ipad, so they can pull up my Garmin inReach tracking and put a big map on as well. I think it's cool so if nothing else, I've made myself happy. Like a lot of things I do as a parent, it's the little in between moments that have an impact. I don't think that this station will take the place of me being gone. But it hopefully, it will create a connection to me and our lives together that will hopefully sustain all of us during the next 40 days.